This soup is packed with fiber, thanks to the quinoa and the whole-wheat dumplings. For a pop of color, use black or red quinoa-which also hold their shape better than the white variety (cooking times may vary). Heat the oil in a large Dutch oven or pot over medium-high heat. Add the onions and cook, stirring, until the onions begin to soften, about 5 minutes. Add the garlic, vinegar, and thyme and stir until most of the vinegar has evaporated, about 2 minutes. Add the carrots, celery, 1 teaspoon salt, and a few grinds of black pepper and cook, stirring, until soft, about 6 minutes. 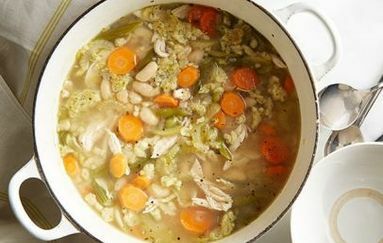 Add the broth, 4 cups of water, chicken breasts, and cannellini beans, bring to a high simmer and cook until the chicken is tender and cooked through, 20 to 25 minutes. Carefully remove the cooked chicken and set aside until cool enough to handle. Add the quinoa to the pot and cook until translucent and tender and the threadlike germ wraps around each kernel, 10 to 12 minutes. Meanwhile, remove and discard the chicken skin and bones. Shred the meat into bite-size pieces and add back to the soup. Stir together the flour, parsley, eggs, milk, baking powder and 1/4 teaspoon salt in a medium bowl. Put half the batter into a perforated colander; holding the colander just over the simmering soup, scrape and work the batter through the holes with a rubber spatula, letting the tiny dumplings drop into the soup. Cook until the dumplings float, stirring to break up any large clumps, about 1 minute. Adjust the consistency of the soup with more water if desired and season with salt if needed.